Posted December 17, 2005 by niallfarrell in News. 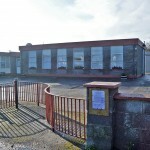 The old school in Carnmore opened its doors on June 16th. 1885. when Fr R. McHugh was the P.P. 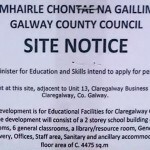 in Claregalway. In the intervening 120 years the school has been very successful, growing in numbers of pupils and staff and providing a high standard of education for the youth of the area. We are not sure whether the original school building had 1 or 2 rooms. In 1935, the school was refurbished but it wasn’t until the arrival of Fr Callanan in 1968 that running water and flush toilets were installed. When the present Principal, Philip Kyne arrived in 1975, he came to a run-down dilapidated building, totally unsuited to the needs of the pupils or the staff. As time went by, the old school deteriorated and at one stage it was rat-infested. One morning the young Principal arrived in to find a dead rat in the toilet! At this stage there were only 2 toilets altogether in the school—one for all the girls and the other for all the boys. There were 75 pupils in total on the rolls. There was no toilet for the staff! 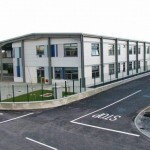 In 1977, as pupil numbers increased, a third teacher was appointed to the staff and a temporary pre-fab. was added. As this pre-fab. was already second-hand, it quickly disintegrated – with a hole in the floor and a leaking ceiling. It, too, became rat-infested. So bad was the condition of the school that in 1980 a campaign was launched to raise funds for a new school. And thus the Mayor of Carnmore project was launched. The four candidates, Mattie Greaney, R.I.P., Siobhan Leonard, Marcus Conroy and Padraic Fahy, between them raised the then enormous sum of £25, 000. We owe these fund-raisers a huge debt of gratitude. With this money, a new site was purchased and work on the new school began in 1982. On December 14th. 1983, the new school was officially opened. The opening ceremony was a total non-event as the PP Fr Callanan, did not want any publicity whatsoever. So, there were no dignitaries or media presence, not even a photographer! All we had was a blessing and Mass. In his homily, Fr Callanan told the parents that the Board of Management had 6 pence in the kitty! We have come a long way since. In the 80s and 90s, the school continued to prosper and grow in numbers. In 1984, we appointed our 4th. teacher and in 1990 our 5th, And as the numbers continued to grow, we added on two pre-fabs. and appointed an additional teacher in 2001. Work on the new extension began in August 2004 and was completed by Easter 2005. We take particular pride in the fact that the builders, the Conneely Brothers are past pupils. All who have seen the extension have been impressed by the imaginative design by architect, Roddy Mannion and the quality of the workmanship. We are also immensely proud of the fact that Noel Grealish, T.D. who performed the opening ceremony, is also a past pupil. In August 2004 and again this year, we made further appointments. Our staff now consists of Principal, Philip Kyne, 6 mainstream teachers, 2 Special Needs teachers and 2 Special Needs Assistants. All of us in Carnmore N.S. parents, teachers and pupils are very proud of what we have achieved in our school.. In our view, our school is as good as the best and better than most. We look forward to the future with confidence. Footnote: Our most famous or infamous former teacher was the noted Irish scholar and novelist, Mairtín Ó Cadhain who served as Principal from approx. 1932 to 1937. He was sacked from his job for alleged republican activities. Later on, he was interned in the Curragh and it was there that he started work on the novels which would later make him famous. On his release, he worked for a while as translator in the Dáil. As his literary work gained recognition, he was appointed Professor of Irish, in Trinity College. In 1980, on the 10th. anniversary of his death, RTÉ did a special documentary on his life and work. Under the direction of Sean Ó Mordha, the documentary crew visited the old school, looked at old roll-books belonging to Mairtín and interviewed some of his past pupils. The irony is that if Mairtín had not been sacked from his Principal’s post in Carnmore, he may never have achieved the fame which he was later to enjoy.